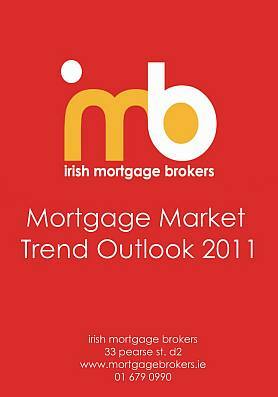 It’s a new year and we have a new set of predictions for the Irish mortgage market in 2011. In our report (get it here or click on the image) we go through them in detail (bullet points below) and we also review our forecast for 2010 to see just how inaccurate we were on the calls we made for last year. 1.Banks will push up interest rates by another 100bps or 1% (independent of any move by the ECB) costing the average borrower (loan of €200k over 25yrs) an additional €1,280 p.a. Rate hikes may start as early as this month. 2. Variable interest rates will generally start to rest at or north of 5% by 2012. The state controlled banks in particular will be forced to make some painful decisions on interest rates they charge to customers. 3. Fixed rates may be temporarily removed from the market, offered on a limited basis or priced out of the market. 4. Property prices will continue to decline. 5. Segmentation of the property market. 6. Total credit not likely to pass €6bn in 2011, with tranche management being a key consideration, there may be funding gaps in Irish banks during the year which cause delays in draw-downs. 7. Rental prices to stabilize. 8. Large increases in repossessions. 10. Banks shedding staff and closing branches. We hope you find the report interesting and useful, if you have any comments or queries you can comment below, call or email, we’d love the feedback. I refer to your above article, Mortgage market trends 2011. I actually sought you out after reading it in the Evening Herald yesterday. I note Happilly, the piece here omit’s the propaganda on Tracker Mortgages being Fixed rate Mortgages & the implied implication in the Herald that if Karl Deeter is right the potion of tracker mortgages that is fixed (bank profit margin’s) will be subject to increase if fixed rate Mortgages are removed. I cannot tell you as an Investor of my anger at this Breech of contract should thy even try it! I assume from reading your post here you didn’t imply it? & maybe as such, you should complain to the Herald for implicating you in such a Pro Bank propaganda drive & associating you in what would become a legal breech of contract bloodbath.